Matt Mackrides posted seven points as the Chesapeake Bayhawks swept the season series with the Florida Launch on a scorching hot Sunday in Boca Raton, Florida. Down 3-1 in the first, the Bayhawks used a 6-0 run, over a 13:00 span and Chesapeake would never look back. Ben Rubeor opened the scoring just 34 ticks into the game, picking up where he left off last weekend, as he scored five goals in their home opener. 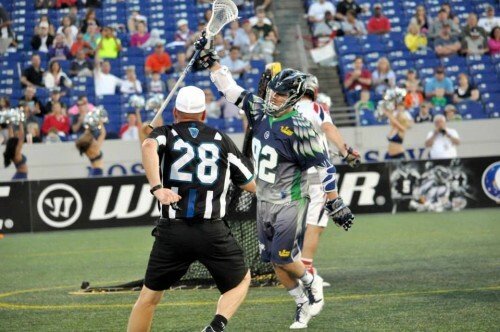 Casey Powell, Steven Brooks, and faceoff specialist Mike Poppleton would rally the Launch to a 3-1 lead, all before the Bayhawks took over. Brooks scored the only two goals for the Launch in the second quarter, on his way to a four goal day. Roman Lao-Gosney and Kieran McArdle each tallied two goals. Villanova product, Jack Rice and Ben Rubeor each had a pair of goals. Bayhawks midfielders Ben Hunt, Jeff Reynolds and newcomer Colin Dunster all had goals. Even long poles, CJ Costabile and Jesse Bernhardt got in the box score. Launch goalie Brett Queener was injured from a diving save against Matt Striebel early in the first period. Queener left the game and did not return with what looked like a lower body injury. Striebel was called for in the crease on the play. Adam Fullerton, stepped in for Queener. “Better on ball defense, we have to dictate where the dodgers are going,” Adam said sternly after making 12 saves on 26 shots on goal. The Launch will look to find their first win of the season on the road as they square off with the Rochester Rattlers next Sunday, May 3rd at 1 pm. Chesapeake will return home and host the Ohio Machine next Sunday, slated for a 4 pm face off. All MLL games can be viewed using you WatchESPN app on ESPN3.